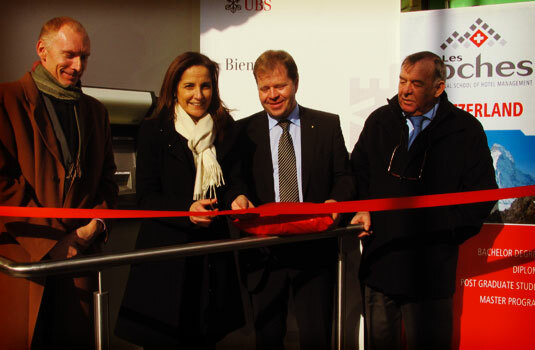 Share the post "Les Roches International School of Hotel Management welcomes ATM machine of UBS on campus"
Les Roches International School of Hotel Management added another feature to its campus in Bluche, Switzerland when the famous Swiss bank UBS opened an ATM machine in the Café du Village building. Les Roches CEO, Sonia Tatar, joined the regional director of UBS Valais, Pierre-Alain Grichting, President of the Bluche-Randogne village, Paul-Albert Clivaz, and vice-director of UBS Crans-Montana, Antonio Trabacchi, at the official inauguration of the UBS ‘bancomat’ on Thursday, February 3rd. The Les Roches students are now able to use an ATM machine on the campus. Photo: (from left) Antonio Trabacchi, Sonia Tatar, Pierre-Alain Grichting and Paul-Albert Clivaz at the inauguration of the UBS ATM machine at Les Roches Bluche.